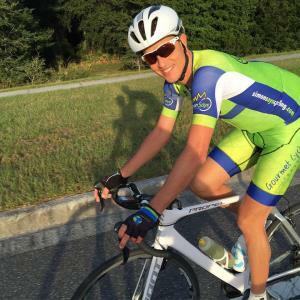 Coach Simon Kessler became the 2016 Florida State Road Race champion in the Masters A 40-44 age category with 6 weeks of focused training averaging 8-12 hours/week. This plan is an enhanced version of the training he followed using the new Workout Builder Feature (works with power only). This training plan is designed for the cyclist who can train around 8-12 hours a week and who is looking to peak for a goal road race. Designed by former professional and multiple national champion coach Simon Kessler of Simon Says Cycling, coach Simon has coached for 25+ years and has enjoyed an incredible track record as a coach which includes state and national champions on multiple continents in road, track and mountain biking. Some of Simon’s clients have won world championship medals and worn the yellow jersey in the Tour de France. With this plan you receive 30+ years of top level experience in a super effective training plan that will lead to fast improvements. Training plan description: The training plan focus includes three weeks of threshold intervals and muscular endurance training followed by three weeks of high intensity V02 and race simulation intervals and leg speed. You may include some races in these final few weeks as part of your preparation. Prior to this plan you should have a good level of fitness and have been training consistently for 10-12 weeks for a minimum of 8 hours/week. Purchasing this plan includes: Email support from coach Simon directly to get your questions answered plus 1 month access to our membership community with Facebook live coaching calls every Wednesday & additional information on nutrition, race day preparation, strength training, warm-up protocols, mental training audios, and much more! Threshold intervals to improve your FTP. The goal is to keep a smooth and consistent effort throughout the interval. These intervals are best performed on a flat terrain, steady climb, or indoor trainer. Your target power is listed for each interval. Aim to average within 10 watts (above or below) the target power number shown. Big gear interval to develop muscular strength endurance. Your target power is listed for each interval. Aim to average within 10 watts (above or below) the target power number shown. The big gear interval is ideally performed on a route with no stops and on a relatively flat terrain (or indoor trainer). Stop if you have any knee or other pain. This session is designed for both indoors and outdoors. You can increase the overall ride time in Zone 1-2 (optional). After your warm-up ride at a high tempo intensity for the time specified. The power target is Normalized Power (not actual average). You may be above target on hills and below on downhills. While on the flat aim to ride around the power target. To get the most out of this training perform the tempo riding in one go with no stops (or trainer). Group ride - for large, competitive group rides aim to practice strategy and positioning by drafting effectively and cycling near the front. If you are one of the stronger riders don't hold back in doing lots of work in the pace-line. Go for sprints (if applicable). For small group rides of a few riders a good strategy is for each rider to take 3-5 minute pulls on the front in Zone 3-4 before going back in the line. When drafting in the pace line work on high cadence by spinning over 95 cadence. Intervals alternating 4 minutes at Sub Threshold / 1 minute at V02 repeated... This session improves your lactate tolerance. Focus on smooth transitions back down to Sub Threshold each time. Your target power is listed. Aim to average within 10 watts (above or below) the power listed.